Nokia Lumia 520 Blocked a Bullet and Saved a Police Officer's Life. How ? How did you feel when you read the title of this post ? Shocked ? Maybe, I was also shocked and stunned when I read it. 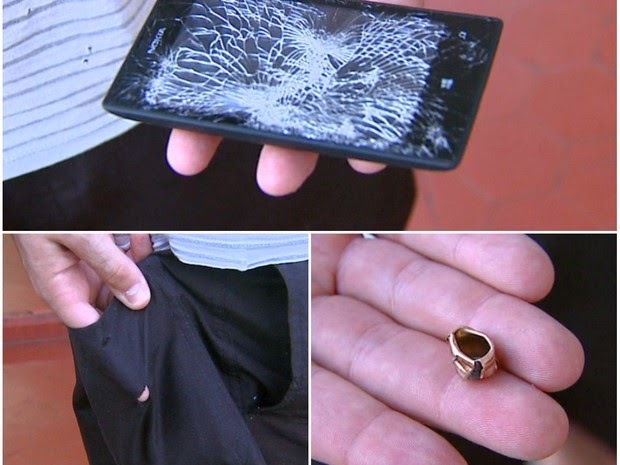 How will an ordinary Nokia Lumia 520 save a police officer's life, not even a bulletproof ? Well, few days ago, Phone Arena published this news and I decided to share it with everyone here. Here is what happened. A 24 year-old military police officer went over to his parents' house with the intention to ask his mother to wash his uniform for him. Little did he know that he was about to arrive at a crime scene – two robbers were looting the house, all the while holding his mom and dad as hostages. Probably after seeing the uniform in his hands, the criminals quickly realized that the young man was a police officer and fired a couple of rounds at him. Luckily, nobody got hurt after the shots had been fired. One of the bullets missed the officer, while the other hit the said Lumia 520, which was inside his pocket. The smartphone was damaged immediately, as you can see from the picture above, but its owner walked away safe, sound, and supposedly a Nokia fan for life. The robbers, which successfully made off with several phones, jewelry, and more of the family's possession, have not been caught yet though. To be candid, this one is strong !!! (Eleyi gidi gan-an !!!). To cut a long story short, I have few questions for you guys - "Are you thinking of buying a Nokia Lumia 520 because of this amazing story ? or you think it has nothing to do with Lumia 520, that it's just a matter of luck ?" Kindly share your own viewpoints by making use of the comment box below. Have a pleasant week !! !